DIY Glitter Glass Emoji Christmas Ornaments Made w/ Silhouette Machine - Who Said Nothing in Life is Free? Who Said Nothing in Life is Free? Helping You Find the Best Deals Daily! I just wanted to share my latest DIY craft project… Glitter Glass Emoji Christmas Ornaments that I made with my Silhouette Machine. Aren’t they just the cutest ?!?! Hi, can I please get the emoji file please? I would love this emoji file please! Would the emoji file work with a Cricut in Design Space? I would love to have it if it does! I LOVE these!!! I’d love to have the file. ❤️❤️ These are too cute!! Thanks! this file is the cutest!! Looking forward to making these Absolutely creative!! Can you please send me the file? these are so awesome. Can you please share the emoji file? Could you please send me the file, too? Too adorbs! Can you please share the file with me? I would love this! Hi, these are awesome, would love the file. I would love the file please! could you please send me the file? these are so amazing! ive been searching for the file and cannot find them! could you please send them to me? Wow this is awesome. Would you please share your file with me? Love it!!! I would love it if you would share the file with me!!! Thank you! These are adorable! What a great idea. Can you share the file? Love these! Could I please get the file. Would also love the Grinch and Jack Skellington from your site!! Hi! This is so cute! I would love the file please!! I would love this emoji file. Can you send me the file? I would love it. These are so cute! Could you send me emoji file please? I would love the file if you would share. I’m doing an emoji birthday party for my daughter and these are fantastic!! I would love this file if you are still sharing! Making xmas ornaments and these are awesome. Thank you. I would love the file. Thank you. These are the cutest! Are you still giving the file out?? Would love it if you are thanks! These are too cute. I would love to have this file. These are so CUTE!!! I would love to have the Emoji cut file Thank you so MUCH!! Adorable! I would love the emoji file if you’re still giving it out. Thanks! If you still are giving out the file . .. I would love to make these for my daughter’s cheerleading team. Thank you very much. Happy Christmas in July. This post has just come thru my feed. I would love to have the emoji patterns. You wouldn’t happen to have the one with the “nerd” glasses? A young man in our church lost his life to leukemia a year ago and that has become the little emoji when remembering Hudson. I would like the emoji file please. Could I please get the file too? Please. O this is so cute. I love it. Is it possible that you can sent me also the emoji file? Thanks! I love these. Will you please send me the file? Thank you very much! My daughter is obsessed with emojis, could I please have this file? If you are still sending the emoji files I would love to get it too, thank you! I would love to have the emoji file, please! Absolutely LOVE these! Would love to have the file if you are still sharing. Thank you!! Is it possible to still get the file? Thank you so much. I would love a copy of the emoji file if still available please! Thanks so much. If you are still sharing the file for the emoji faces I would just love it, so I can make these for my nieces and nephews. Thanks so much. If you are still sharing this file, I would love to have a copy! They are just too cute! I would really like the pattern. My granddaughter would love these. Thank you. Would you mind sending me the file as well? Thank you! Hi, your emoji faces are just wonderful, would it be possible to send me the file so I can make for my children. Thank you. Love these!! Any way you would send me the file for my daughter? Thank you. I am very interested in this file please. If you are still sharing the emoji file my son would love to make these for his Grandma. It’s a inside joke for them. Thanks in advance. Could you please send me your emoji file? We have a craft fair at school we could use them for.. Ijust love your ornaments. Thank you! Your ornaments are so cute. I’d love your face file. My daughter is going to an emoji party. THANKS, PS found you on pinterest. Yes, where can I find the file? Please send me the file. So cute! Would these work on a Portrait? If so I would love the file. Please and thank you! These are so cute and would be a perfect gift for my niece for Christmas! If you are still sharing the file for the emoticons, I would love to have a copy please. Thank you! Would love to have the emoji file if still available. Thank you! Can I please have the file? Would you be able to send me the emoji file as well? They are so cute! I would appreciate the emoji cut file also. Thanks! These ornaments are so cute! Can you please send the file? Would love the file if you are willing to share. Hi there- I’d like to receive the emoji file if it’s still available. Thanks! Would you mind sending me the emoji file? I LOVE them! My 8 year old daughter is obsessed!!! These are so cute. My thirteen year old daughger and friends love emoji’s, if you are still sharing the file can you send it to me. Thank you in advance. I love your ornaments! Can you send me the file for the faces? Thanks! May I please have the emoji file if it’s still available? I’d appreciate the file as well! Thanks! So amazingly adorable!! Are you still sharing the file? I would be so grateful if you are! Hi, are these files still available? Thank you! These are so fun! I’d love the emoji file when you get the chance, please and thank you! please send me the file, thank you! Would love the file, Can you sent it please? My daughter would LOVE these! Can you please send me your file! What a great project for my girls. I would love the file. Thank you!! This is a great idea to do for the schools craft workshop. Can you please send me the file? Thanks so much! These are great!! Would you please share the file with me? Thanks! I would love the file too, please and thank you!! These are adorable. Wondering if you are still offering the svg file. If so, will you please send it to me too?!? These are the best ornaments ever! My 8 year old daughter is throwing a holiday party and I know the girls would love to make these. I showed her a picture of your ornaments and she got so excited. Can you please send me the emoji file if it’s available? My daughter would love these! Would u please send me the file. Thank you in advance! I would really appreciate the emoji file please. Can you send me the emotional file please? MY daughter is in love with these. 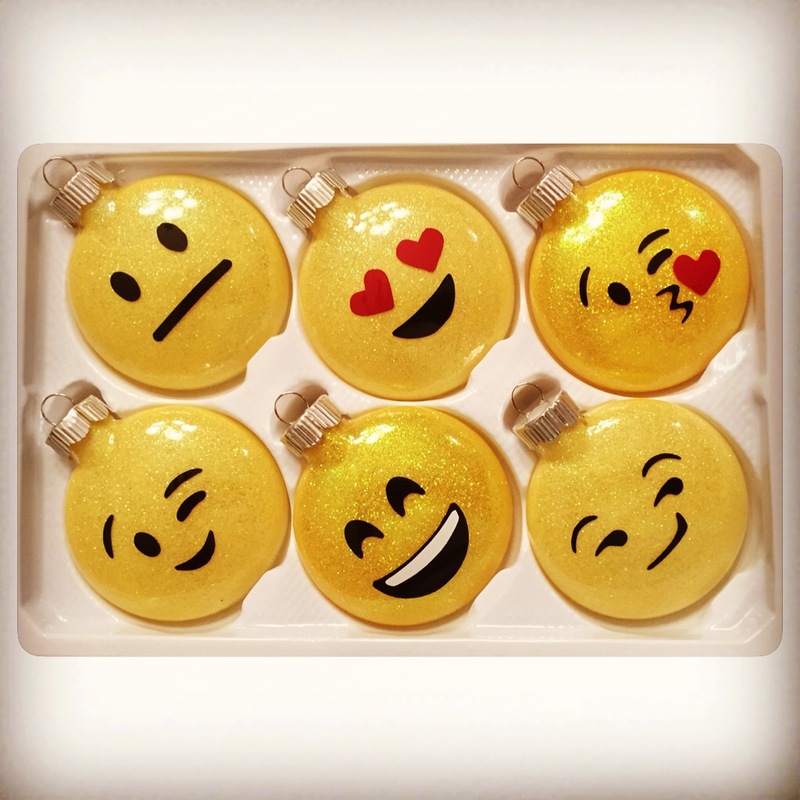 I love love love these emoji ornaments. I would love the file if you’re still sharing. These are adorable. I’d love to have the file too! Would love to make these for my son….can you share the info? I would like to have this file if you are still sharing! Thank you so much! Could you please send me the Emoji file. These are so cute! I love your work!! Is it still possible to get a copy of the file? These are adorable. Want to make these with my grandchildren. May I please have a copy of your emoji file. Thank you so much. I too would love this file. I realize it’s been a couple of years and you may not still be doing this but if you are I sure would love it. Thank you. Are you still sharing the file? They’re so cute, I’d love one!! Hello, I love your emoji ornaments and I’m wanting to make with my daughter, can you please email me the emoji file? If you are still checking these messages and it is available, I would love a copy of the emoji file.